One of the basic, yet vital things a developer should know when creating macOS apps is how to present alerts, system panels or custom windows to their apps. Regardless of how small or big an app is, it will always be necessary to display an informational message to the user or ask for confirmation. Letting users to search for and open a file from their drive is the case for many kinds of apps, as well as saving back to disk. Presenting any of the above can happen in two different ways: Either as a modal dialog, or as a sheet. When presenting as a modal dialog, the new window sits on top of the current window and interaction is allowed with that only. There is a title bar and window can be dragged around in the screen. When presenting a window as a sheet, then there’s no separate window and no dragging can happen. Instead, the new window is sliding in from the top of the current window and looks like it’s a part of it. The common thing with the modal presentation is that the new window stays there until we dismiss it, and it doesn’t allow interaction with any other content underneath. I would recommend to take a look at the Apple’s Human Interface Guidelines about dialogs, alerts and sheets. How to present an Open Panel and let users open files of specific types (files with specific extensions). How to present a Save Panel to do the exact opposite and store a file anywhere on the disk. How to show Alerts with different kind of content in them. How to handle a custom window as a sheet. Let’s get started, and let’s have a quick look of the demo app that we’ll be working on. Then we’ll jump straight into the new stuff we have to learn here today. The demo app that we will focus on today is a light image editor. It is going to be capable of letting us open any image from the disk, apply four image filters, resize and save back to disk as a new file. There is a starter project to download, as most of the business logic has been implemented already. Even though we’ll discuss about image filters (CIFilter objects) at a later part, I’d like just to mention from now that two out of the four provided filters require user input. We’ll make the app ask for that input through alerts, something that is not recommended to do when writing real world apps, however it’s a great way to see additional features an alert can provide. More about that later. Image’s name and size are meant to be shown on the top right side of the window. A Resize button lies there too, which will trigger the presentation of a new window controller as a sheet. In that window, we’ll be able to provide either custom values for the width and height of the image, or scale it down using a preset percentage. More about that later as well. Let’s go now through a quick presentation of the rest of the app. As said already, most of the logic of the app is already implemented so we can focus on the alerts and panels that the app will be presenting. Note that the implementation of the app is based on the MVVM (Model, View, ViewModel) pattern, so the actual business logic gets separated from any actions made in the view. Note: If you need to read about MVVM in Swift, here is a great tutorial to do so. The ImageTools class. It implements a few class methods that help in loading an image from and saving back to disk, getting the image size and performing resizing. The ImageFilter enum. An enumeration that not only contains the available filters provided in the app, but it also has code related to the them, such as creating the actual CIFilter, getting the parameter names for those filters that need user input, the range of acceptable values of the parameters, and a few more. Pre-existing code in the project contains enough documentation and therefore it won’t be hard to understand what each single piece of it is all about. I should mention also that the majority of our work here will be done in the ImageEditorViewController class; we will visit the ResizeViewController just for a while. I would recommend you to take some time and have a tour in the starter project. Once you feel comfortable with it, let’s go straight into creating our first alert. They can display important messages to users, or ask for user’s input without the need from us to create custom windows to do that. They provide an interface (UI) that users are familiar with, as alerts are part of the macOS system. So, when showing an alert to users, all we do is to provide our custom content; the look and feel is known to them and they know how to interact. It’s obvious that when no image is loaded it is impossible to apply any filters or do resizing. However, and regardless of how apparent that fact is, wouldn’t be nice to have an alert being presented when users try to apply a filter while no image exists? That way not only users will be reminded that they have to open an image first, but it’s a move that helps in the overall user experience (UX). Going down in programming level, available filters are presented in the colorFilters popup button. As a side note, the datasource of the colorFilters popup (or in other words the items presented in it) is the availableFilters property of the imageEditorViewModel object which returns an array of all available filters as they exist in the ImageFilter enum (imageEditorViewModel is the ViewModel object that implements all the actual business logic). Initially, the first line with the guard statement checks whether there’s an image loaded and displayed or not. The displayedImageData of the imageEditorViewModel holds the loaded image data, so when it’s nil it indicates that there is no loaded image in the app. In that case (execution falls to the else case of the guard statement), we make a call to the showNoImageAlert() method. It doesn’t exist yet, we’ll change that right next. Regardless of the selection user made in the filters popup, we automatically switch back to the first option that displays “none” (no filter applied). We return from the function – necessary with the guard statement! 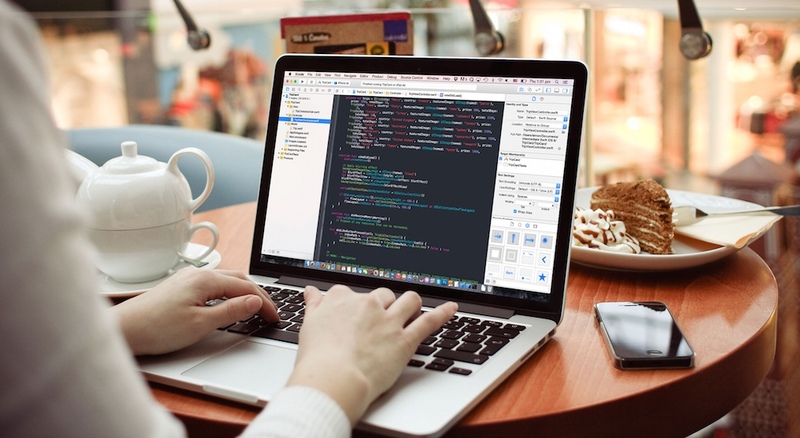 The above lines of code is the first implementation we do on that method. Later we’ll add some more code. The first thing we do is to check whether an alert is allowed to be presented through the value of the showNoImageAlert property of the imageEditorViewModel object. When it’s true, then we can display the alert, otherwise nothing should happen. Why do we need that condition here? You’ll understand pretty soon. alert.informativeText = "There is no image to apply the filter to." For a simple alert what we just did is sufficient. Note that when an alert is presented, it’s using the app’s icon on the left of the displayed content. As there is no custom icon in the app, the default one provided when Xcode generates the project will be used. The beginSheetModal(for:completionHandler:) of the NSAlert class will perform the actual presentation. The first parameter is the window that the alert will be presented to, and in that case it’s the main window of our app (we access it through the view property as you can see). When a button is tapped on the alert, the completion handler is called with a NSApplication.ModalResponse value describing the button that was tapped (find out more here), and the alert gets dismissed. Notice in the above, first implementation of the showNoImageAlert() method that we haven’t specified any buttons or button titles. That’s perfectly okay, as NSAlert will create automatically an “OK” button. Also, we won’t use the response value in the completion handler here. We’ll see how to determine the clicked button later. Congratulations! You just created your first alert! Alerts mostly exist to notify users or allow to make quick decisions, but sometimes users would prefer not having the same alert being presented all the time as part of a certain process. In that case, displaying a check box that would allow users to select and dictate the alert not to appear again is the way to go. Thankfully, NSAlert provides us with a way to add a suppression button to the alert, and let users choose whether they will allow the alert’s appearance. Actually, the suppression button is a… suppression check box, but it’s called a button because a check box is a special type of button (a NSButton object) too. alert.suppressionButton?.title = "I got it, don't show me this message again." The first thing we do is to enable the appearance of the suppression button by setting the showsSuppressionButton property of the alert object to true. Then, we set the text we want to display. That text should make clear to the user what the suppression button is there for. Click on it and dismiss the alert. Then select a filter again; no alert this time! Note that the effects of clicking the suppression button do not get stored persistently by our app, so if you re-run it you will have the alert back. However, using the suppression button is actually a user preference, and therefore it should be stored persistently in real world apps. Now that we’ve added a bit to the user experience and we’ve learnt how to display an alert as a sheet, let’s make it possible for our app to open an image. In this part we are going to meet a new element in macOS programming, and that is the NSOpenPanel. A NSOpenPanel, or an open panel, is a system window that allows to navigate in directories and select one or more files or directories to be opened by an app. You are already familiar with that window, as it’s provided by any app that supports an Open functionality. 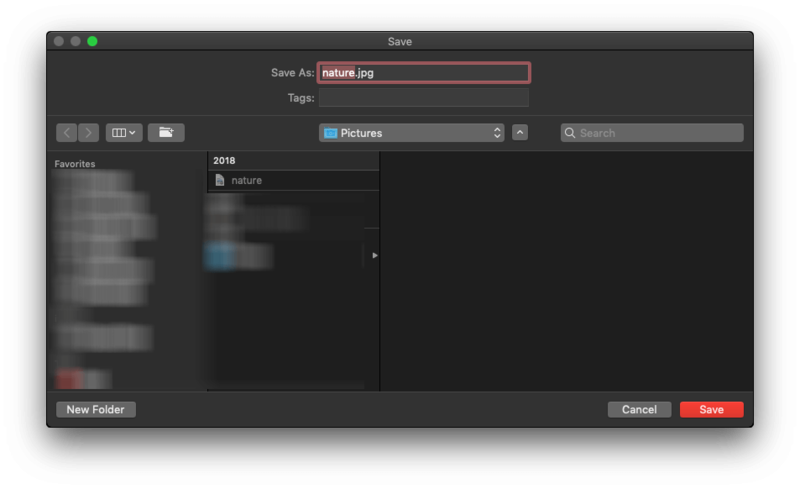 For example, go to Xcode and open the following menu: File > Open…. What you will see is what we will achieve here too. We will be providing this kind of functionality through the Open button existing in our demo app (we won’t use menus, these are meant to be a future tutorial). This button is already connected to the openImage(_:) IBAction method, so whatever code we’ll add there is going to be executed when the Open button gets tapped. We initialize a NSOpenPanel object. We set a few properties depending on what we want to allow through that panel (select one or multiple files, select directories, and more). We present the panel either modally or as a sheet. 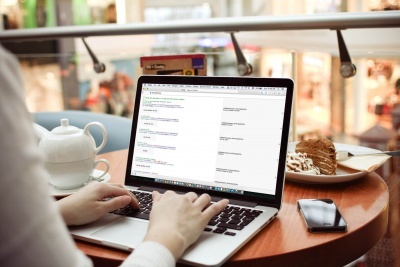 We handle the URL or URLs pointing to the files or folders selected by the user. Disallow to choose multiple files. panel.message = "Select an image to open." // Show the panel modally. In case of choosing a single file or directory, the url property of the panel object will contain the URL to the selected item when the Open button is tapped. Even though we don’t support multiple opening of files here, the way to get multiple URLs from the panel is to use panel.urls. You will get an array with the URLs of the selected files and directories. self.imageNameLabel.stringValue = self.imageEditorViewModel.imageName ?? "" That closure returns the image data (a Data object), so first we create a NSImage object using that data and we assign it to the image view. Then, we get the image name and size string values from the imageEditorViewModel object and we assign them to the respective labels. Note: NSImage is the equivalent to UIImage in iOS. Feel free to run the app now and use the Open button. Spot an image in your computer and open it. 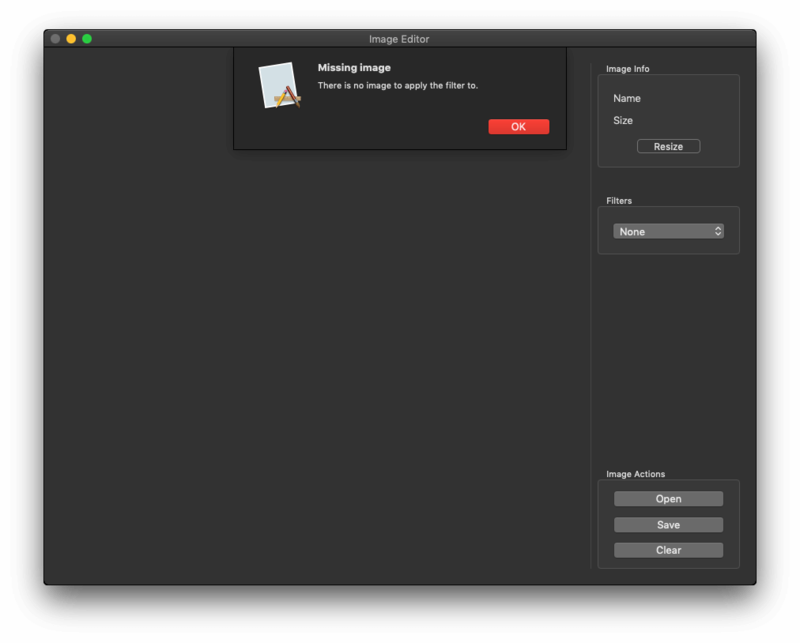 Previously we managed to present an alert with a message saying that an image should be loaded before applying any filter. Now that our app can actually load an image, let’s make it possible to apply filters to it. Programmatically speaking, a filter is a CIFilter (Core Image filter) object that will modify an image in a certain way. You can find all available filters by Apple here and read about the CIFilter class here. All filters mandatorily require the source image that they will be applied to. 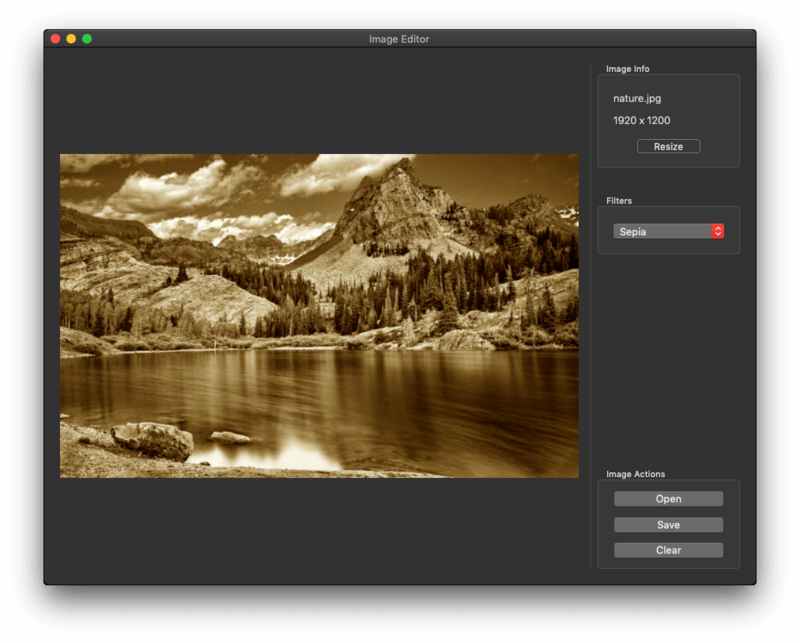 In addition, Sepia and Blur require an additional parameter value to be provided so they can produce the final result. Sepia expects for a parameter called “inputIntensity” with values ranging from 0.0 to 1.0 (default value is 1.0). Blur expects for a parameter called “inputRadius” with values ranging from 0 to 100 (default value is 8). In a real world app, we should provide controls that users would expect to see for this kind of changes, like for a example a slider. However, here we won’t do that. As my goal is to show almost all alert capabilities, we’ll present a text field into an alert to get the user input for the parameters described above. Note: Please see the code in the ImageFilter enum on how to create a CIFilter, how to get the parameter names, acceptable value ranges, and other related functionalities, or do an additional search on the Internet. I will avoid to discuss the filter details here as it’s out of the original scope, and the tutorial will end up really long. AlertFilterValues is a typealias (defined in ImageEditorViewModel.swift file) of the tuple: (minValue: String, maxValue: String, paramName: String) which includes the minimum acceptable value, the maximum acceptable value and the parameter name for the selected filter. The filterValues parameter value will be provided by the imageEditorViewModel object when we’ll call this method. alert.messageText = "Apply Image Filter"
alert.informativeText = "Enter a value between \(filterValues.minValue) and \(filterValues.maxValue) for the [\(filterValues.paramName)] parameter:"
The first button you add will appear in the right side of the alert, while the last one will be the the left-most one. You can add up to four buttons to an alert, but don’t get used to that too much; the less buttons an alert has, the better for the user experience. Now, the important stuff. NSAlert gives the ability to add custom views to an alert through a property called accessoryView. Of course, this is not meant for building an entire UI embedded in the alert, but it’s quite useful in cases where you need something more on top of what alerts can offer. We will make use of that property, and we will assign to it a text field (a NSTextField object), so we can type the parameter values in. Feel free to change the frame of the text field and reposition or resize it to see what happens. alertFirstButtonReturn regards the right-most button so you understand the order. Use either an if-else or a switch statement to determine which button the user has clicked on. If you have a fourth button, then the else case in an if-else statement, or the default case in a switch statement will regard that button. The isValid(value:) of the imageEditorViewModel object will validate the input value. If it’s a valid one, the dictionary with the parameter name and that value is created and then passed as an argument to the applyFilter(usingParameters:) method. In any other case we call the method passing nil and indicating that way that the default value should be used for the filter. Notice that before we check for validity in the first button case, we convert the typed in value from String to Double. If user has entered something different than an acceptable number, then the else case will be executed. With the first two lines we determine the filter that should be applied based on the user selection. The appliedImageFilter property of the imageEditorViewModel object holds the selected filter value. Then, we make a call to the shouldSetFilterValue() method to see if a parameter value is required for the selected filter. If not, then we call the applyFilter(usingParameters:) method we talked about previously passing a nil value. Otherwise, we get the values we want to show to the alert (min and max parameter values, parameter name), and eventually we call the showAlert(withFilterValues:) we implemented right before. The app can now apply filters to the loaded image, so you can go and try that out. Make sure to provide both valid and invalid values to the alert when selecting Sepia or Blur filter and see how it behaves. Here’s how an image would look after applying the sepia filter. In the previous parts we managed to initialize, configure and present alerts and the open panel, and we saw that we can display them either as modal dialogs or as sheets. These presentation modes can be applied in custom windows created in the app too, and we are going to see that in this part. In our main UI there is a Resize button which is supposed to present the ResizeViewController in a new window controller (both the new window and view controller exist in the Main.storyboard file). The most expected thing to do would be to create a segue in the storyboard and then present the resize view controller modally by performing that segue. But no, we won’t go that way. Instead, we’ll load the window controller in code so we can present its window along with the content view controller as a sheet. 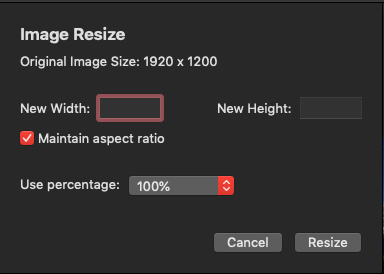 The ResizeViewController gives two different options to perform resizing: Either by setting an explicit width and height (with the option to keep the original aspect ratio or not), or choose from some predefined percentage values to scale down the displayed image. All that functionality is already implemented so our work in that view controller will be short. We will focus only on how to dismiss it as a sheet sending back the proper NSApplication.ModalResponse value when the Resize and Cancel buttons are clicked. Initialize a NSStoryboard object necessary to access the objects described in the next steps. Access the window controller using the scene identifier “ResizeWindowController” which is also set in the Main storyboard (see the Identity Inspector after selecting the new window controller object). Get the window controller’s window (resizeWindow above). Get the content view controller, which is ResizeViewController instance. Make sure that there is a a current image size. Note: Please read this previous tutorial for more information about window controllers, windows, and details on loading from storyboards in code. Notice that the displayedImageSize value is given as an argument to the set(originalSize:) method of the resizeViewModel object (the ViewModel object) of the resizeViewController. Obviously, our next step is to examine the response value, and get the new size set in the ResizeViewController when response is equal to “OK”. But wait a minute, this is a custom window and not a system panel, so is it possible to give us back such a value? Yes, it is, but we have to manually do so. Open the ResizeViewController.swift file and spot the resize(_:) and cancelResizing(_:) IBAction methods. They are empty for now, but they are called when the Resize and the Cancel button are clicked. Initially, we unwrap the window object, as well as its parent window that presents this one as a sheet. Then, we call the endSheet(_:returnCode) method using the parent object, and we pass two values as arguments: The current window that should be dismissed, and the appropriate NSApplication.ModalResponse. resize(toSize:) method is already implemented, so the above will work. That’s it, now you know how to present custom windows as sheets and to dismiss them accordingly passing the proper return code back to the caller. It’s possible to create your own custom NSApplication.ModalResponse codes, however I leave that aside for now, it’s a bit out of our scope. Run the app, load an image and then resize it. The resize window is presented as a sheet! As a side note, keep in mind that if you resize and then you apply a filter, the image will revert to its original size. That’s because filters apply to the original image, so you’ll need to resize again. You are free to modify the given implementation and change that if you want. 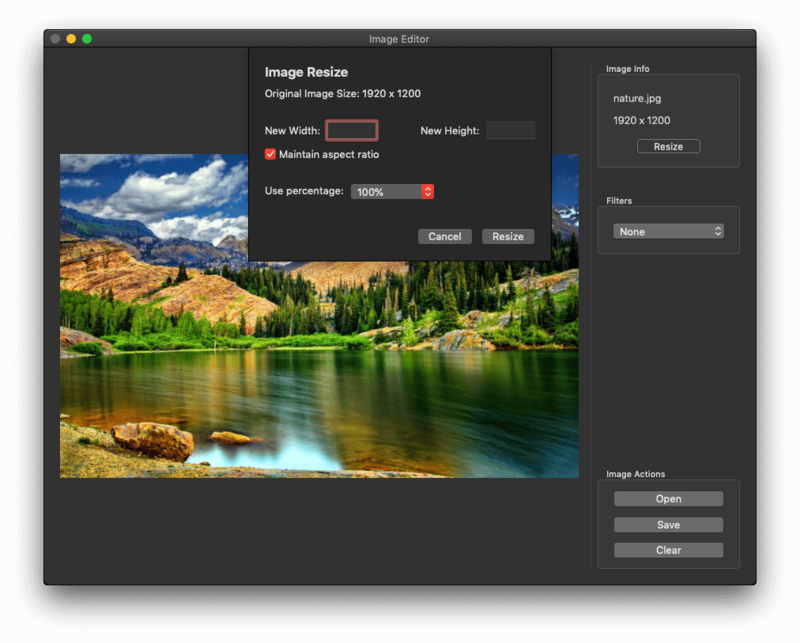 Now that our small image editor works fine as it can apply filters and resize an image, let’s add the final touch, and let’s make it possible to save the edited image to disk. Opposed to the NSOpenPanel class we used earlier to open an image, now we will use the NSSavePanel class to save. However, and that’s important, there is another step that must be done prior to that; to make our app capable of writing anywhere. Enable the App Sandbox capability. In the File Access section, change the permission to Read/Write for the User Selected File entry. This will create a new entitlements file that will contain the new permissions you just granted to the app. If you skip or forget this step, you’ll be getting exceptions when you try to present a save panel in your apps. 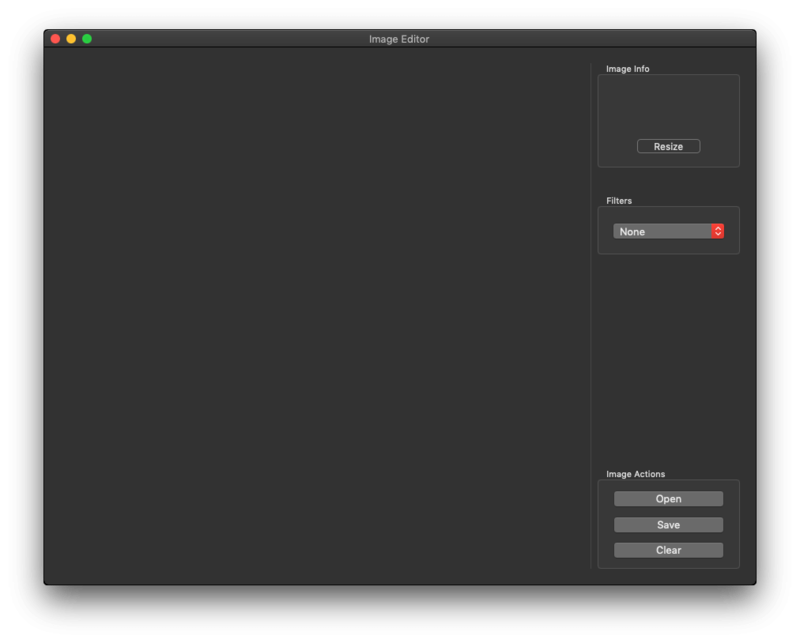 savePanel.nameFieldStringValue = imageEditorViewModel.imageName ?? "untitled"
The allowedFileTypes property expects for an array of file extensions that should be allowed in the save panel. 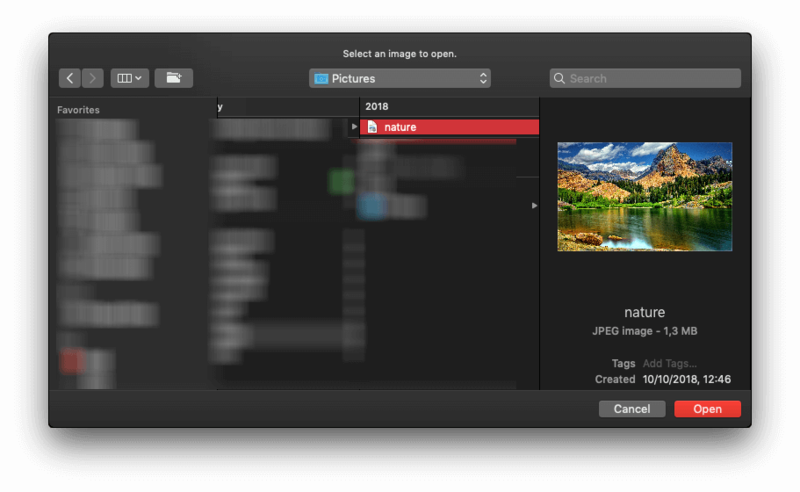 In our case, and given that users can open various kinds of image files, we use the extension of the loaded file (i.e., when “png” is opened, “png” to be saved as well). nameFieldStringValue property can be optionally set. When you do that, you set a preset file name to be shown in the save panel which users can change. If you omit using this property users will just have to type a file name before being able to save. canCreateDirectories is pretty much self-explanatory. When true, an additional button to create new folders is showing app in the save panel. isExtensionHidden hides or shows the extension of the file name set using the nameFieldStringValue property. After we finish this part, feel free to play with the above properties and see what happens if you change their values, or just omit setting a custom value. If the response value is “OK”, meaning that the user clicked on the Save button, then we will get the URL to the selected file, and we will use the imageEditorViewModel object to perform the actual saving of the edited image to disk. Note: A save panel is used to give you back a URL, it doesn’t perform the actual saving which is up to each app. Remember that we did the same with the open panel; we just used a URL from it, the actual loading of the image took place elsewhere. The saveImage(toURL:) method of the imageEditorViewModel initiates the actual saving job. It returns a Bool value depending on whether the saving was successful or not. We don’t make any use of that result here, but I leave it to you to decide if you want to do something with that (i.e., to show an alert if saving fails). Presenting alerts and default panels is a basic knowledge that every macOS developer should have. Whether you will display them modally or as a sheet lies mostly on the overall app appearance and behavior, but it’s a personal decision too. By completing the implementation of the demo app step by step we managed to discuss all the important details of this post’s topic. Besides alerts and the open and save panels, we also made it clear how to present a custom window of our app as as sheet too. As a final word, using system alerts and panels is a good way to provide users with interfaces that are familiar with, so it is easier for them to get used to our apps and feel comfortable with them. This is all we want after all.